TRAVEL.org - Italy. Find Lodging, resorts, activities, apartments in Rome, and site seeing in Italy. Travel Italy - Updated information and reservations for hotels, Spas, thermal sites, ground trasportation services, religious tourism, school tourism, amenities and tour operators for travelers in Rome, Florence and Italy. Regions of Italy Specific travel information broken down by region in Italy. TravelBoards.eu - Travel community and forums for travelling in Europe and Italy. Life In Italy - Life In Italy Offers daily News from Italy and original articles and features about Italian culture, food, a subject-specific forum and community, and details of related news and events. Topics include art, fashion, cinema, genealogy, heritage, language, tourism, regions, religion, sports, travel, and wine. Rome Tours by City Wonders - City Wonders offers the best tours of Rome and throughout Italy of the top attractions with expert, English-speaking guides. Italy4Real - is a family run tour operator specialising in small group tours to Italy and around Europe. We love our work, designing amazing trips for our clients and, most of all, Italy! Offerte Viaggi Weekend - Italian Travel blog with information about special offers for trips and week ends. (In Italian). You can choose among fitness centre, romantic, and cultural experiences. Why Go to Italy? - One stop Travel Guide to all kinds of information about Italy. Italian Breaks - Look through our handpicked selection of holiday homes in Italy. Beautiful Italian villas which will give you a holiday to remember, picked by Italy specialists who know the area intimately. Tour Mount Blanc with WalkingHolidayItaly.com - Adventures around the Alps Monte Rosa and Monte Bianco. Go To Italy - Italy Reservation Center of Historical Relais, medieval Monasteries-Hotels and charming Abbeys filled with art treasures. NECA Florence - Study abroad in Italy - Accredited Study Abroad Programs for university students in Florence, Italy. TuttiVoliCatania.it - Find Catania airport location, live departures, arrivals, information, route maps, weather forecast, list of airlines and all flights. Lake Garda Tourism - Lake Garda is the largest and most popular lake in Italy. Lakegarda.biz covers all the activities, places to stay and other regional info in this beautiful location. Travel Punk! - Offers students, backpackers, budget and independent travelers, tips, handy tools, free email, hostel and eurail info for visiting Italy. Help, links, and message boards. Positano Charter - Excursions and transfers day or night trolling the Amalfi Coast, Li Galli Islands, Nerano, Napoli, Sorrento, Salerno, Capri, Ischia, Procida, and Ponza. Italian Sites - Web Portal of Italian Websites that offer service in English. RhinoCarHire.com - Italy Auto Rentals - Compare online rates and deals for Rental Cars in Italy. Milan Airport Transfers - Private Transfer Service in Milan. Car Hire Italy - Get cheap car rentals quickly and securely online with Firstcarhire. Europe on Rail - Travel the easy way. Free Incoming Calls! - Buy or rent an international cell phone for your trip to Italy and get unlimited free incoming calls - not to mention the lowest outgoing rates! Click on the link for more info. European Cultural and Activity Tours - A selection of small specialist companies offering cultural and activity tours in Italy and the rest of Europe. In Rome Bed & Breakfast.com - A strict selection of bed and breakfasts and apartments in Rome. Italy Farmhouse Rentals - Italian Travel Guide, Vacation Rentals in Tuscany, Umbria or Lazio. ITALY AT YOUR CLICK! Italia Lodging - Accommodation in Italy - Bed and breakfasts, apartments and hotels highly selected in Italy. Living in Rome - High standard accommodations and apartments located in the best areas of Rome, plus a guide to living in Rome. Bridgewater Travel's Idyllic Italy - We are a family owned and managed Italian villa rental specialist. We hand pick Italy's best rentals and work with an extensive network of reliable owners and Italian colleagues. Flat in Italy - Apartments all over Italy! Your best accomodation! TravelEden.com - Rentals in Italy - Travel Eden offers an extensive collection of quality self catering holiday rentals in Italy including luxury villas and modern apartments. Vaca Villa - Italian villas for rent - VacaVilla offer villas and apartment for rent in the most beautiful regions of Italy like Tuscany, Umbria, Amalfi Coast, Sicily and Garda Lake. Italy Unique - Italy self-catering Holiday Vacation rentals. Holiday Inn Meeting Rooms in Italy - At Holiday Inn we offer meeting rooms across the Italy, providing choice of event venues. We have the perfect location for all occasions. Rent In Italy - Short term apartments in Rome, Florence, Venice, and Amalfi Coast. High standard, quality apartments at fair prices. Rome City Apartments - Flats in Rome for your holidays and for business stays. RomeScape.com - Find all types of Rome accommodation including apartments, hotels and bed and breakfasts. Luxury Hotels in Rome - ItalianCollection.com - Discover our fine selection of boutique & luxury hotels in Rome, Italy. Book online your charming hotel in Roma. Rome Hotels - Special offers on Hotels in Rome. Hotels in Rome - Free online reservation for Hotels, B&B, Apartments in Rome. Rome Apartment Rentals - Apartments in Rome - Short term rentals of fully furnished apartments in the heart of Rome. Bed & Breakfast in Rome - Classified Ads for finding or promoting a B&B in Rome. Discounted Hotels and Accommodations - Discounted rates on Hotel rooms, Car Rentals, Flights, Vacation Rentals. Discountedhotels.com, your complete travel resource. Venice Holidays For Family - Confortable apartments for families, located in the centre of Venice, available for short-term rentals. Villas in Italy for rent at www.italy-villas.com - Luxury villas with pools, farmhouse rentals and apartments available. Personal service available. Toll-Free phone. Lucy House - Rome San Pietro Bed & Breakfast - Lucy House features a bedroom per 2 or 3 guests, bath and a living and kitchen area. Walk to San Pietro Basilica, Castel Sant’Angelo, Lungo Tevere and Trastevere area. Accommodations in Lucca - Selection of accommodations in Lucca, such as farmhouses, villas , holiday rental apartments, and bed and breakfasts. Find Tuscany Villas at TuscanyOwners.com - Exclusive villas with pool close to the best Tuscan places to visit: Florence Apartments, Tuscany Villas and Hotels. all direct by owner. Holiday Homes Tuscany - We select exclusive private villas for rent for your vacation in Tuscany, Italy. We propose luxury villas in Florence, Siena, Chianti and Lucca. Salogi Villas - owns exclusive selections of Farmhouses and Villas in Tuscany and other attractive areas of Italy. Houses in Tuscany - Properties for sale or rent in Italy. Villas, bed and breakfast, farmhouses and rural cottages in Tuscany. Tuscany Holidays Accommodations - Selection of accommodations in Tuscany, such as farmhouses (farm holidays), holiday apartments, villas, hotels, and bed and breakfasts. Villas in Umbria - Holiday rentals in Umbria, Italy. Carefully selected, wide choice, excellent price/quality, personal assistance in selecting the best rental for you. Le Torri Vacation Rentals - Villa vacation rental apartments. 2 or 4 bdrms in heart of Tuscany, top Hills Chianti area near Florence. IperHotel.com - Hotels in Rimini, Riccione, Bellaria and other Italian cities. To Tuscany - Check real-time availability of over 300 beautiful villas in Tuscany. Book online & save with our Price Promise Guarantee. RL Italian Rentals - Tuscany Villas - Tuscany villas near Florence, Lucca and Siena as well as in the Chianti region, the Tuscan heartland. Tuscany Villas - Villas for rent in Tuscany. Luxury villas with pools and family accommodations. Florence Lodging - Your complete resource for your Lodging in Florence: Tourist apartments, Villas, B&B\'s and more. Locali D'Autore - Tourism Information. Organize your trip around Italy in a meaningful way. Make sure you stop at the most beautiful and memorable spots. Find Interesting hotels, villas & resorts throughout Italy. Amalficoast.com - Your on-line guide for accommodation in hotels, bed & breakfast, villas, farmhouses in Amalfi Coast. B&B Sant'Agostino - Milan city centre. Elegance, confort, private bathrooms, unlimited free wireless Internet,and italian breakfast all included. Italy House Rentals - Italy Vacation? Villa, Farmhouse, Apartment, House rentals throughout Italy including Tuscany & Umbria. Italy Villas - Italy villas include villas for rent, farmhouses, apartments and vacation rentals. Italy Classifieds.net - Offers classified ads for Italy, including vacation rentals. Search by regions, cities and localities. Villa in Umbria - Umbria: Personal assistance in selecting the right holiday house for you. Lake Garda Italy - Guide to the lake and its main destinations with travel advice and weather. Cuendet & Cie Spa - Cuendet offers the largest selection of Tuscany villa rentals and more than 3000 villas and vacation homes in Italy, France, Spain and Portugal. RentalsPark.com - Find Apartments and Villas in numerous different towns & cities in Italy. Milan Hotels -Online secure booking with discounted prices. Rome Apartments - Rome Apartments - All apartments are centrally located! Book Hotels in Rome - Wide choice of Hotels, Bed & Breakfasts and holiday Apartments at discounted rates! RentalinRome.com - Rental In Rome offers a large choice of apartments, villas and studios in the heart of Rome, Italy. Save up to 50% on hotel fees. Tuscany villas and furnished apartments - Vacation rentals in Tuscany, Italy. Rome apartment rentals - Serviced apartments in Rome. Florence Hotels - Online booking for hotels in Florence. The San Felicissimo farmhouse in Umbria, Italy - situated on the lovely hill of Poggio Pelliccione, only 4 km from the historical centre of Perugia, with magnificient views of Assisi and Santa Maria degli Angeli. Venice Hotels - Online reservation for hotels in Venice. Rome Apartments - A listing of classified ads regarding short term rental apartments in Rome. Hotel Gabry (Trentino) - Lake of Garda - 3 stars hotel in Riva del Garda. Millennium B&B - offers a large choice of bed and breakfast and apartments in Rome, Italy. Book Italy Hotels.com - Italian Hotel Collection. Over 300 secret and luxurious hotels all over Italy at great low rates. Rome Hotel Service - Last minute deals for accomodation in two, three and four star hotels located in Rome downtown and all Italy. Vacation Rental Network - Find a beautiful home, villa, or condo in our extensive database of vacation properties for Italy. Worldwide Villas - Stay at a luxurious condo or villa in Italy, with the comforts of home, and the amenities of a resort, all for less than the price of a hotel room. Vacation Rentals .com - Find lovely, furnished private homes, villas, and condos of all sizes throughout Italy. RomeReservation.com - The Rome Reservation Company provides prestigious apartments, villas, bed and breakfasts, hotels in the heart of Rome and in Italy. ItalianStay.com - Quality and Exclusive Vacation Rentals in Tuscany and Umbria. Scenic Rentals - Vacation rentals in beautiful locations around Italy. Guest In Italy - A large selection of hotels, apartments and B&B in Rome, Florence, Venice. Online Booking. Guided Tours too! Hotel Mirage - Florence)....A modern four star hotel, with easy access and free parking! Visit Florence Italy - Travel guide to visiting Florence, offering tips and info on main city attractions and accommodations. Florence Accommodation - Accommodation Guide to Florence with reviews of bed and breakfasts, apartments and hotels. Rome Info - Travel guide to Rome features information on hotels, apartments, sights and entertainment in Rome. Roma Experience - Guided Tours of Rome, Vatican City and Florence with local experts. Choose your experience! Go To Rome - Tourist Attractions. Comune di Roma (Italian) - Tourism info. Letsgo2 Rome - Create a flight and hotel package and save on city breaks to Rome from the UK. ATOL bonded for your financial protection. Rome Airport Transfers - Private Transfer Service in Rome. Worlwide Accom.com Rome - We pride ourselves on hand picking only the best luxury apartments in Rome. We inspect them and take the photos. We also write the descriptions on our website! Rome Apartments - Find and book a large selection of apartments in Rome. Shortstay Rome Apartments - Short Stay and short term Rome Apartments, vacation and holiday rentals. Find Apartments in Rome at RomanHomes.com - Rome apartments, vacation rentals, luxury apartments with terrace and views. Villas with pools. Apartments in the center of Rome. Rome-San Pietro Bed & Breakfast - Puccini Room features a bedroom per 2 or 3 guests, bath, living area. Walk to San Pietro Basilica, Castel Sant’Angelo, and Trastevere area. Euro Hotel Guide - Find rooms in over 300 hotels in Rome. 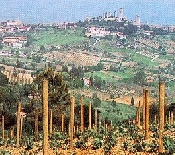 Find Tuscan Villas at ThriftyTuscany.com - Find villas, apartments amd hotels in Tuscany. Based in the heart of Tuscany, ThriftyTuscany.com capitalizes on its direct contact with the territory. Locanda Viani - Holidays in San Gimignano - Villa Rentals in San Gimignano with Tuscany Traditional restaurant and Tuscan wine tasting. Tuscany Villas For Rent by Your Tuscany - Fine selection of villas for rent in Tuscany. We propose luxury villas with pool and staff. Discover Tuscany - Guide with tips & info about attractions, events and accommodations in Tuscany. Tuscany.org Directory - Useful resources about Tuscany (Toscana), with reviews of the best related websites. Summer's Leases - Tuscany & Umbria Villas - Tuscany and Umbria self-catering rental villa experts. We deal directly with owners so we can offer the best rates. Agriturismo Tuscany - Lodging Guide to Tuscany Farmhouses, Villas and Bed & Breakfast with details and maps for every property listed. Tuscany villas and furnished apartments- Vacation rentals in Tuscany, Italy. Villa I Due Padroni - B&B in the beautiful wine region of Lombardy, the Oltrepo Pavese, south of Milan. Situated on a panoramic position in the hills. Venice Water Taxi - Private ground and water airport to city transfers in Venice. Charming Puglia Hotels - offers relaxing, luxury vacations to the Apulia region in Italy. Lake Maggiore - It is the second largest of Italy and largest of southern Switzerland. Borromean Islands - On the western side of Lake Maggiore. Charming Sardinia - Your online specialist for luxury holidays in Sardinia presents a refined selection of charming hotels and luxury services in Sardinia. Sardinian Dreams - A one stop shop for both holidaymakers wishing to book a holiday in Sardinia at the lowest prices, and property buyers and sellers. Hotels in Sardinia - Find a a huge selection of the best and most popular hotels in Sardinia. AmalfiCharter - Excursions and transfers day or night trolling the Amalfi Coast, Li Galli Islands, Nerano, Napoli, Sorrento, Salerno, Capri, Ischia, Procida, and Ponza.